del.icio.us discover is a set of visualizations and explorations into link-spaces in the del.icio.us collaborative bookmarking network. It was created with Processing and Perl, using historical data gathered in early March 2006. Direct and abstract visualizations of intra- and inter-user relationships. Simple, implementable algorithms to recommend links-of-interest that might otherwise be missed by a user currently utilizing only popularity-based link aggregators, and ideas for their further usages. 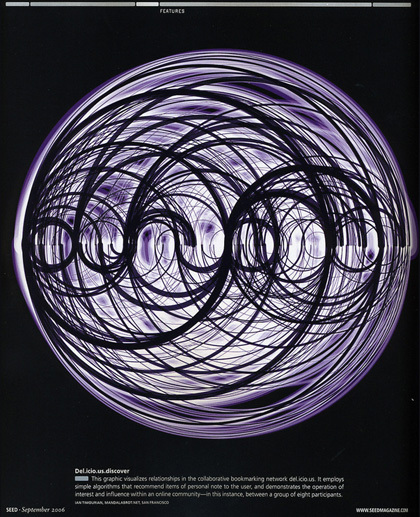 This project received coverage in 2006 in several data visualization blogs, an article on Visual Complexity in SEED magazine, and most recently in Manuel Lima’s 2011 book Visual Complexity: Mapping Patterns of Information.